In the run up to the London Show on October 29th, and in the days since, things have been somewhat hectic for me, so I’ve only now had a chance to properly go through my pictures – which, as tradition now dictates, are not very good. I’ve selected a few and edited them into something usable, though, and present them below with my comments. 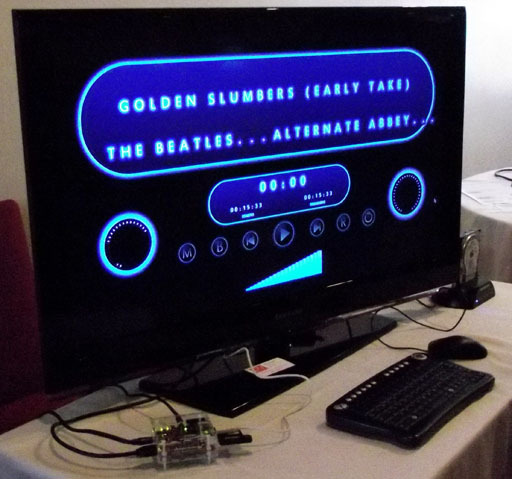 The Raspberry Pi was obviously the main attraction at the show, and we had the pleasure of not one, not two, but three slices. The board will ship in two versions. Echoing the BBC Microcomputer, some 30 years ago, these will be a Model A ($25) and a Model B ($35), with the chief difference between the two being more memory, and a two port USB hub and ethernet controller on the Model B. There was a rumour on the day that the board was already in production, but this turned out to be incorrect. All things going according to plan, the board should be available to order directly from the Raspberry Pi Foundation website some time in December. Keep an eye on their site or join their mailing list to be in with a chance of obtaining the board when that happens. Alternatively, keep an eye on eBay around the same time; the Foundation plans to auction some as limited edition signed (in very, very small writing, obviously) boards. The big question in the run up to the show, of course, was whether or not RISC OS was going to be running on the board. To which the answer, as everybody in RISC OS-land probably knows by now is “yes”. The port is far from complete and, as such, not without problems, but RISC OS was indeed running. 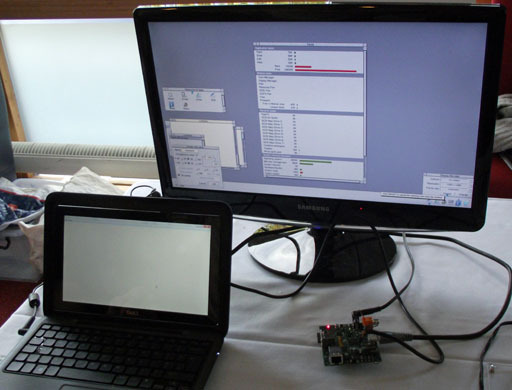 One of the problems was the lack of USB drivers, so a Windows 7 NetBook was being used to handle mouse and keyboard input, which many people thought was rather satisfying, and another was the lack of any facility for a hardware sprite, which RISC OS uses for the mouse pointer, so the pointer was implemented fairly hurriedly in software, and there were redraw issues as a result. RISC OS Open Ltd had a new development at the show: Two USB sticks under the banner “native|emulate” (which are now available from their website) each selling for £10. The “emulation” stick contains ready-to-run versions of RPCEmu for 32-bit Windows systems running Windows 2000, XP, Vista and 7, and Intel-based Macs running Mac OS X 10.5 (“Leopard”), 10.6 (“Snow Leopard”) and 10.7 (“Lion”), with simple installation instructions. 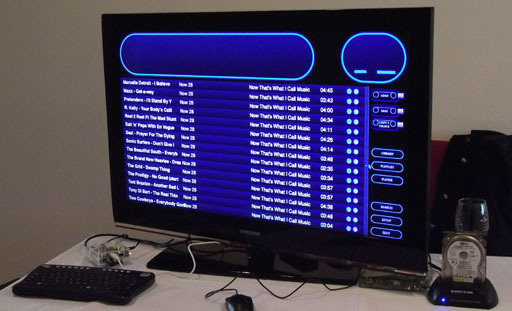 For Linux users, instructions are provided in order for them to build the emulator for their particular distro. The “native” stick is filecore formatted and contains the main RISC OS boot sequence, applications and utilities, as well as a host of third-party applications and other goodies. 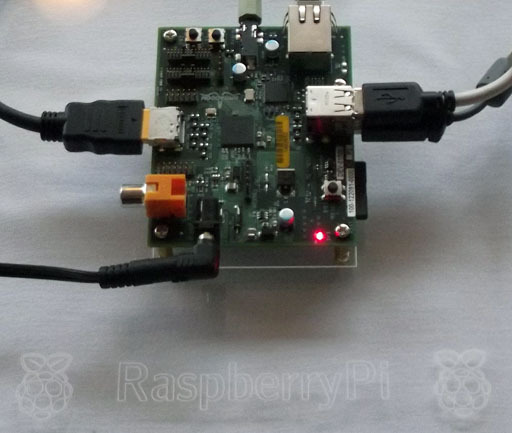 If you are setting up a BeagleBoard to run RISC OS , for example, then one of the steps is to copy a suitable boot sequence onto a filecore formatted USB stick in order to use it with the BeagleBoard – so this USB stick provides a cheap and easy way to simplify that step. 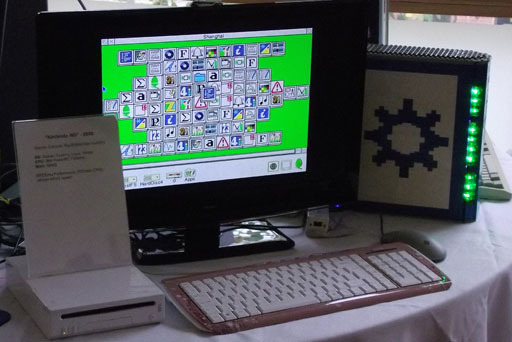 Ever present at RISC OS shows, Martin Wuerthner was there with a new version of EasiWriter and TechWriter, the structured word processors. Version 9.0 introduces an automatic way of keeping cross references up to date. This means that if, for example, on page 23 of your document you refer to an image on page 24, and later edits push that image onto page 25, you no longer need to manually check and update the reference. Such references can also act as hyperlinks, so that if the document is exported as a HTML or a PDF (or Word) document, the reference becomes click-able. This update also provides improved ODT import. Whereas in version 8.9x, documents were imported as plain text, they are now imported with style information, thus improving file transfer between RISC OS and the rest of the world. In a remarkably fast turn around, after first stating there would be no more Drag ‘n Drop magazine, and then apparently being persuaded by Andrew Rawnsley to keep it going, Paul Stewart was present at the show with a new issue – volume 3, issue 1. When I spoke to Paul before the doors opened, he still seemed fairly reluctant to keep it going beyond this issue, but towards the end of the show he caught up with me to quote that immortal line from Mastermind, “I’ve started, so I’ll finish,” with the news that he intended to keep it going for at least the next volume. Martin Hansen had his usual colourful stand for The MathMagical Software Company, with new versions of Flicker and Iconizer. Flicker IV is an animation package which plays sprite files as movies, and can also be used as a ‘powerpoint’ style presentation package. Martin is also using it to try and revive interest in ‘tracker’ music. Iconizer produces mathematical objects called ‘strange attractors’, colourful, wispy images of intricate beauty, and the new version of is rewritten in ARM assembly language. With this version, images that previously took 25 minutes to produce on an IYONIX now take around 24 seconds. On the ARMini, Martin said, the same image takes around 13 seconds. Impressive stuff. Of less interest to RISC OS users, recent months have been devoted to getting a range of quality GCSE mathematics worksheets smartened up and online. Made using Draw and TechWriter, the PDF files are free to download from the MathMagical website. Martin also told me that he’s half way through a couple of new projects but it’ll be next year before they are ready for release. A couple of days before the show a new issue of Archive Magazine arrived here, so it’s no surprise that Jim Nagel had a ready supply with him at the show. Issue 23:2 includes the usual news pages and regular columns, along with a reports and photos from the Wakefield 2011 show, the GAG show, and Arche 2.0, an article from Nat Queen about the new ‘cookie’ legislation that is now in place in the UK and likely to be enforced from May next year, and much more. 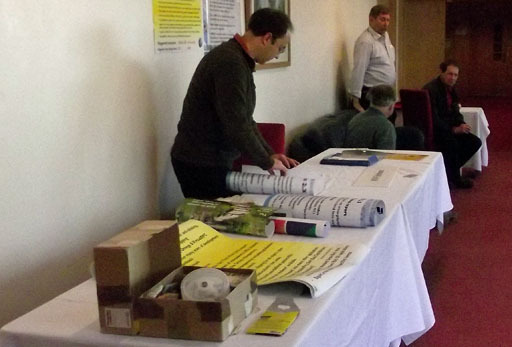 Jim was also taking orders for the Archive CDs and DVDs, which are a good way to access the wealth of information that has been published in the magazine in the many years it has been going – not to mention a convenient way to actually store that information. Nigel Willmot had a new version of Organizer at the show. The personal information manager for RISC OS is highly regarded amongst users, and version 2.14, which is a free upgrade to users of 2.1x, allows contacts to be added and listed by company/organisation name. 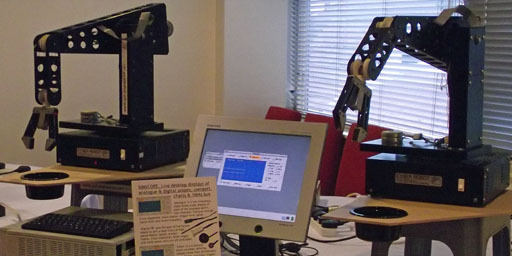 RPCEmu was being demonstrated by Peter Howkins running on a variety of computers – including a Nintendo Wii running Linux. Next to that, sporting a blue RISC OS cog and visible on the right in my picture, was an A7000 computer in a lego case. Alongside RPCEmu, Trevor Johnson was representing WikiProject RISC OS, the goal of which is to raise the quality and range of articles about RISC OS and associated hardware and software on Wikipedia, the online encyclopedia. There are a number of ways to get involved – the most obvious being to help with editing and updating relevant pages on Wikipedia, but there are other ways to get involved if you don’t feel up to that. For example, you might have old magazines and newspapers containing references that could be used in articles, or access to hardware for which it’s hard to find suitable pictures. I had a long and interesting chat with Jason and Andy from The Centre for Computing History, which had a clutch of BBC machines on display, each doing its own thing. The computing industry is, by its very nature, a rapidly changing one, and a result of this is that many technologies become either irrelevant or outdated in a short space of time and, within the industry itself, disregarded – and this is where the museum plays a key role, by attempting to preserve what it can of our computing history, rather than let it be forgotten. 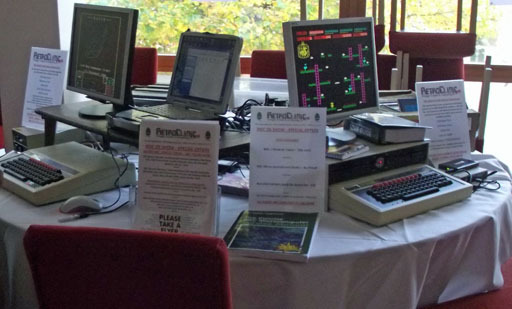 Currently based in Haverhill, Suffolk, but in need of a more accessible location, not to mention more space, the Centre is planning a move to Cambridge, a city that has played – and continues to play – an important role in Britain’s computing history, making it a fitting home for a museum of this sort. R-Comp were selling subscriptions to their ARMini software scheme for BeagleBoard users, not to mention the ARMini itself, RISC OS friendly monitors, a new version of SafeStore, their backup software, and RISC OS friendly network storage devices to use with it, and much more – most notably for me including FireWorkz Pro, now updated to work on BeagleBoard and ARMini systems. I did plan to make that my first purchase of the day, but it actually became my final purchase (along with a new monitor), handled as everybody was packing up to leave! They had actually sold out of CDs by that time, so I had to wait for the post a few days later to receive my copy. Running full screen at the show, Michael explained that the software could be used to create play-lists that will fit into a particular time-slot, with tracks arranged so that the user knows the music will end at a certain time – something that I realised is missing from the software I currently use to manage and play my own collection of music; I can see how long the tracks are, but equating that to the actual time is something I must do myself, and usually just estimate. That’s a particularly useful feature for DJs, who need to organise their music to a schedule. 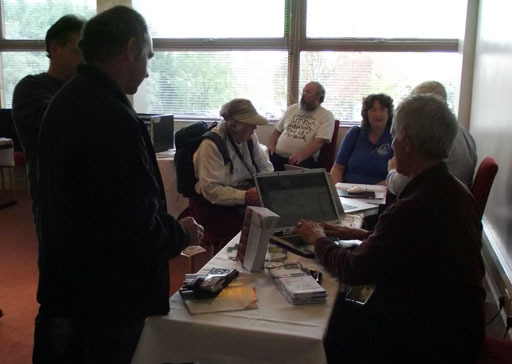 ﻿﻿Steve Fryatt was discussing and demonstrating his popular software, CashBook and PrintPDF, as well as NetSurf, the cross-platform web browser that started life on RISC OS, and for which Steve works on the RISC OS front-end. Sadly, between the last show and this one, Steve’s time has been occupied by a house move, amongst other things, so hasn’t been able to put as much work in on software development as he would have liked. 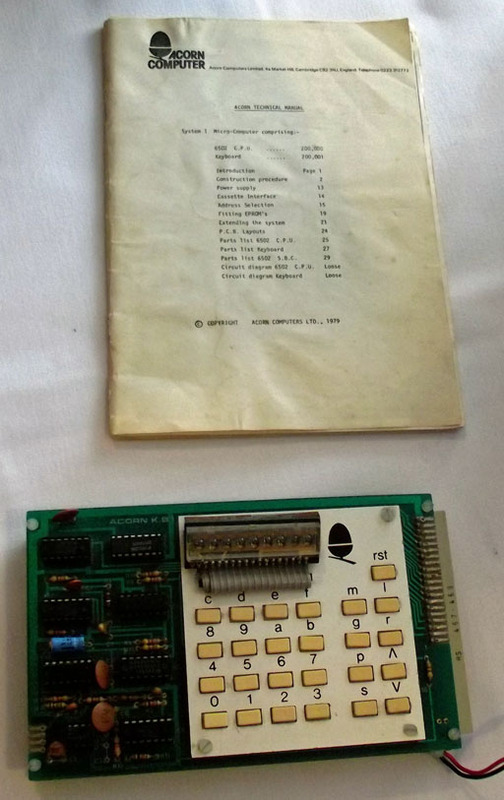 Fans of older Acorn hardware would have been pleased with the Chris’s Acorns stand, where Chris Whytehead had an Acorn System 3, System 4 and System 5 on display – along with a System 1, little more than a circuit board with a hexadecimal keypad for input. 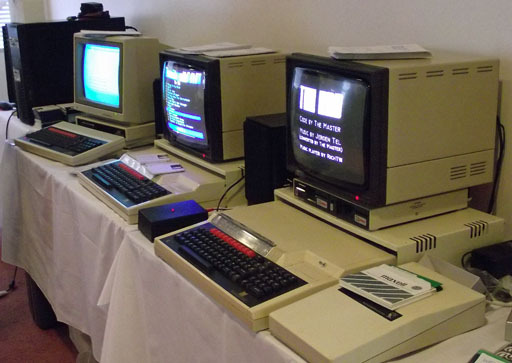 Meanwhile, fans with older hardware, or who wanted to own some, were catered for on the RetroClinic stand, where they could buy a variety of refurbished and updated BBCs, including a Master 128 with an internal DataCentre, giving 1MB RAM, USB, and a 1GB Compact Flash hard drive, and DualOS. The DataCentre itself was also available, in both internal and external varieties, and is a quite remarkable upgrade for an 8-bit computer. Peter Nowosad was demonstrating Charm, an efficient programming language for RISC OS computers. Until recently, I had never heard of Charm, and my assumption was that it was something developed elsewhere and ported to RISC OS by Peter, but it turns out it’s actually a language of Peter’s own devising – and from what Peter showed me, it’s a very mature and capable language. 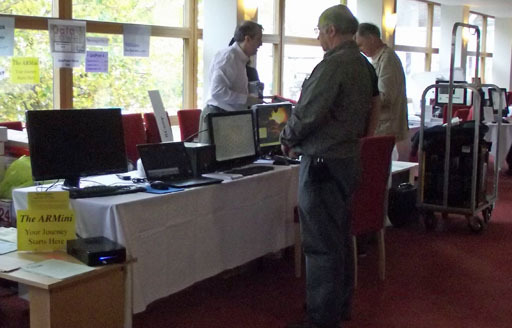 Peter was next to the Soft Rock Software stand, where I mostly tried to avoid being in case anybody asked me if I’d actually done anything since the last time they spoke to me – to which the usual answer of “no” would apply. 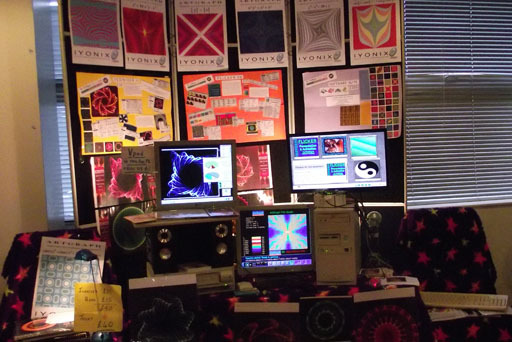 In fact, between the Kenilworth show and this one, I’ve not even had a RISC OS machine set up on my desk – or indeed a desk set up at all, until recently – having been busy redecorating. So this time, at least, I had an excuse. It will come as no surprise to anybody that Chris Evans and Andrew Conroy were present on the CJE Micro’s stand, with a huge selection goodies, and the charity stand, representing the charity Combat Stress, had quite a variety of stuff as well. Sadly, I didn’t manage to sit in on any of the theatre talks. The one I wanted to attend above all others was the Raspberry Pi talk, but it was while I was chatting to Jason and Andy from The Centre for Computing History that we realised everything had gone very quiet; Jason commented that there must be an interesting talk on, and I glanced at the time and my programme and promptly did a facepalm, as that was the talk in question, and it was nearly finished. D’oh! 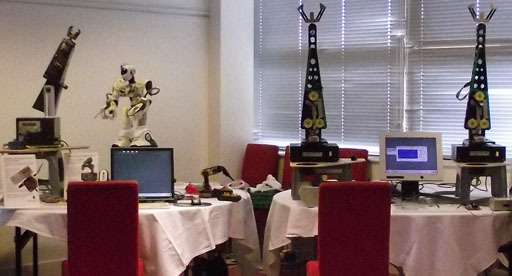 All in all, it was a good show, with a good, positive buzz amongst both exhibitors and visitors alike – and many thanks to ROUGOL for organising it. I leave you with a few more photos – but don’t be fooled by the lack of people in my pictures; most were taken before the doors were opened to the public. 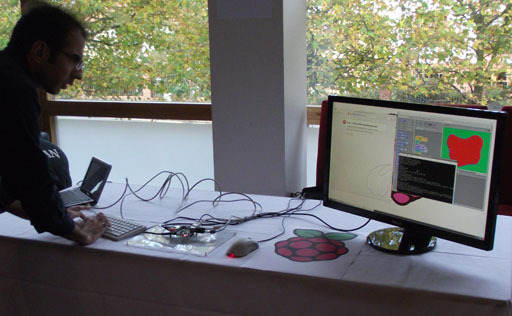 The final picture, therefore, is of the Raspberry Pi stand, taken from my own, mid-show.